One thing that stands out from the stories in the first half of this book is Vonarburg's strong interest in "spirituality", in the kind of "shamanistic" experiences that Europeans tend to turn to indigenous peoples in search of; and thus some of Vonarburg's aliens can be stand-ins for "indigenous people" in a way that could be annoyingly condescending, especially in the first story, "L'oiseau de cendres". Also in "Thalassa" you have an alien people that's in touch with their "dreams" (and can see the future and fly...), in an allegory of contact with "Westerners". In "Éon" the source of enlightenment is the feminine principle, denied by a hyper-male technocracy; it's actually not a really bad story, but the equation "female=life/generation, male=technology/death" is presented without nuance, and of course there are no actual women characters in it. "La machine lente du temps", which is essentially a pleasant time-travel romance, belongs to this group too: the process of Travelling is a "voyage of the soul" through what some people might call "planes", and unmistakably the training is described in the language of initiations. Finally, "Le nœud" explores another aspect of Travelling and the self; apparently it's one of Vonarburg's more admired stories, but to me, reading it after "La machine lente du temps", there was too much repetition, no reason why the character of Egon should be in it. The volume concludes with three stories set in Baïblanca, the stronghold of "civilization" in a collapsing world (the author points out that it's not necessarily quite the same universe in all of her Baïblanca stories, the rest of which are collected in La maison au bord de la mer). These were my favorites of the volume. They lie on the borderland between science fiction and fantasy, where mysterious mutability is attributed to a "virus" (but that's just a name for magic) and where humans are trying to maintain their self-certainty and control in a world that's become unpredictable and hostile; the contrast between control and freedom is one of the main themes here. The stories about "metamorphs" allow Vonarburg to discuss gender and sexuality in a way that would have been daring for a mainstream publisher in the 1980s (though not by current standards). 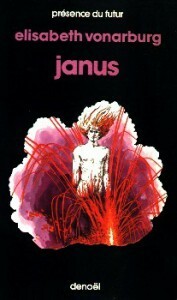 I didn't understand all of "Janus", which deals with constructed life, but liked it a lot anyway.